to prevent lots of problems." The benefits you and your cat gain when you trim your cats claws far outweigh the dangers of having your cat's claws surgically removed. Trimming is a safe and humane alternative to surgery. It's also a good way to keep your cat healthy, protect your furniture, and protect you and your family from getting scratched. 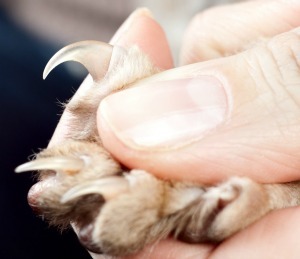 How Soon Should You Begin to Trim Your Cat's Claws? Ideally, you should start trimming when your cat is a kitten. This will help your kitty to get used to the procedure and make it less traumatic for both of you. Kittens are generally easier to train in most cat-human interactions. Giving your kitten a treat after you trim her nails will make the process even more enjoyable for her. Older cats can also be trained to allow you to clip their claws. A treat for your cat comes in particularly handy if you are trying to teach an old cat new tricks. How Often Should You Trim Your Cat's Claws? To keep your cat's claws from becoming too sharp, you should trim his or her claws about every two weeks. This is just a general guideline. You'll have to use your own judgment about when to take care of your kitty's grooming needs based on his or her individual needs (and yours). How often you trim will also depend, in part, on how short you cut the claws. Until you get the hang of trimming your cat's nails, you may want to only cut off the very tip of the nails. Depending on your cat's temperament and how accustomed to claw-trimming she is, she may only allow you to clip a couple of nails at a time. Some older cats have had bad experiences with nail clipping in the past and may not adjust very well. Don't force your kitty if she's having a particularly rough time of it. Remember to give treats and talk soothingly. It's best to trim your cats claws when she's in a mellow mood. After a nap is a good time. After a play session is not a good time. But you could follow up the nail trimming with a play session so your cat associates having her claws clipped with a fun experience. In addition to a firm hand, you'll need a clipper especially made to trim cat's claws. Special clippers are designed to cut your cat's claws at the correct angle to prevent splitting your cat's nails and causing them to bleed. There are essentially two types of clippers. One type is a nail clipper similar to a pair of scissors and the other is a mini guillotine-type. With the mini guillotine-type nail trimmer, you put your cat's claw into the opening and then squeeze the handle of the clippers. This is the type of clippers I used to prefer because it seemed to help hold the nail in place more securely. Unfortunately, my pair broke and I haven't been able to find another pair with good reviews. Whatever type of nail clipper you choose, be sure that the blades are sharp. Dull blades can split your cat's claws and cause pain and bleeding. Clippers made from surgical steel are more expensive, but they last longer and stay sharper longer. For the possible accident (cutting the quick of your cat's claw), it's a good idea to also have some styptic pads or styptic powder around to help stop the bleeding. Accidentally cutting the quick will probably cause some pain to your cat and some bleeding. Don't panic. Using a little styptic will help the bleeding to stop if it doesn't stop on its own. Give you kitty lots of extra attention and loving if you accidentally cut too deep; and stop the rest of the clipping until another time. Long before you begin to trim your cats claws, you can frequently stroke her paws so she gets used to having them touched. When you are ready to trim her nails, having another person help can be useful, but it's not necessary. If you have two people, one person can hold your kitty while the other trims the claws. If it seems impossible to clip your kitty's nails on your own, and someone else is not available to help, you can also try wrapping your kitty in a towel "like a burrito" to restrain her during this grooming procedure. When trimming your cat's claws, hold her firmly, but not too tightly. Take a paw in your hand and press on the joint right above the claw to make the claw stick out. Using a nail clipper made especially for trimming cat's claws, snip off the tip of your cat's nail. Be careful not to clip too closely to the quick. It's best to do the clipping in a well-lit area so you can see the pink quick through the nail. If you have any doubts about how far to clip, be conservative and just cut off the very tips of the nails. Be sure to talk soothingly to your kitty while you're clipping his or her nails and give a reward of a treat and/or some play-time afterwards. This will help your cat associate having his claws trimmed with a positive experience (or at least not too traumatic an experience!). If your cat is too restless to let you trim all of his claws, let him go and try again later or the next day. It's better to only do a couple of nails at a time rather than forcing your kitty to have all of his nails trimmed at one time. Remember to give rewards like a healthy cat treat or lots of praise and petting, or all three! If you're unsure about how to clip your cat's claws or how short to clip them, ask your veterinarian to demonstrate this grooming procedure for you. Many good veterinarians make trimming your cat's claws a part of their regular annual check-up, so you can at least watch then. Unfortunately, some vets charge extra for this service, but it could be worth it to avoid possible trauma to you and your kitty. Cat Grooming Techniques - More tips on grooming your cat, including brushing and bathing your feline friend. Cat Declawing Alternatives - Information about declawing your cat and why this is absolutely not a good option.